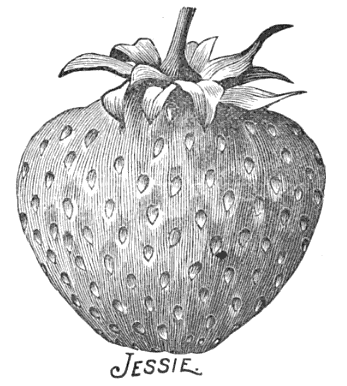 Jessie: a strawberry variety illustrated in The ABC of Strawberry Culture for Farmers, Village People, and Small Growers, by T. B. Terry and A. I. Root, published in 1902. It’s June, which means that it’s strawberry season! (Well, usually it is. This year, the Northwest weather has been unusually cold, and so I bet the strawberries are running late.) If it’s strawberry season, it’s time for a strawberry festival, with some strawberry recipes and menu ideas! 110 years ago in June 1901, Good Housekeeping published “XXth Century Festivals: The Strawberry Festival,” suggesting that festivals should be held on a moonlit evening and furnished with tables with fine white linen tablecloths and fern decorations. The dishes should be strawberry red, green, and white. The following recipe makes a very delicate frappe. Boil for fifteen minutes four cups of water and two cups of sugar, add to it the juice of six lemons and four cups of mashed fresh strawberries or one quart of the canned fruit. Allow it to cool, strain and add one quart of ice water. Freeze to a mush, using equal parts of ice and salt. If you use canned fruit which is very sweet the frappe may not require so much sugar. Boil together in a saucepan one cupful of boiling water, one-fourth cupful of butter, and a speck of salt. As it begins to boil stir in one cupful of sifted flour. Stir constantly until the mixture leaves the sides of the pan and cleaves together in a ball. When partly cool add four eggs, beating them in one at a time. Drop carefully in long narrow strips, some distance apart, on buttered tins, and bake in a moderate oven until well risen---about thirty minutes. Leave the oven door open a few minutes before removing the eclairs, to prevent their falling. When they are cool split one side, fill with sweetened strawberries or jam. Spread with boiled icing colored with strawberry juice. I plan to try this one and will report back.